mommy's reviews: Pamper Your Feet With Dr. Scholl's Massaging Gel Insoles! Pamper Your Feet With Dr. Scholl's Massaging Gel Insoles! All throughout my most recent pregnancy, I dealt with really awful back and hip pain. While I was pregnant, I attributed the pain to the extra weight and also to my joints loosening up and preparing for birth. I am also a bare-footed gal who HATES socks and shoes. When I am home, I am usually barefoot and when I go out, I typically wear flip flops or sandals. I think I just feel too restricted in socks. Anyway, my hip pain did not go away after Isaac was born. When I would walk him around the house late at night, my hip would be screaming at me...almost to the point where I didn't think I could walk anymore. Our family loves to go for long summer evening walks as well and I was beginning to think that those would have to end due to my pain. Well, recently I have discovered a new product from Dr. Scholl's that has really enabled me to walk with less pain, and I am going to share it with you all today! William Mathias Scholl was born in 1882 in Indiana — the grandson of a cobbler and farmer. His expertise in foot care started as a boy when he borrowed his grandfather's tools to repair shoes to earn extra money. 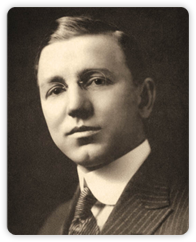 He went on to earn a medical degree in 1904, and started his own company, Dr. Scholl Inc.
Dr. William Scholl’s expertise in shoes combined with his medical background allowed him to develop many of the innovative solutions available today. During his lifetime, he helped bring more than 1,000 foot care products to people all around the world. Today, we the makers of Dr. Scholl’s products continue to advance the science of foot care with the same enthusiasm that young William Scholl did all those years ago. Whenever I am in the foot care aisle of the grocery store, I am automatically drawn to Dr. Scholl's products. I KNOW that they are a good name and that their products are high-quality. When I have issues with my feet whether it be medical or cosmetic, Dr. Scholl's is one of my top brands that I utilize for solving my problems. So, for this review I was sent a set of Dr. Scholl's Massaging Gel Insoles. I was really excited about these because of my back and hip pain and was curious to see if they would relieve my pain at all. The first thing I did was read the package. I loved how easy the directions were to understand. I would have just put the insoles in my shoes without doing anything to my shoes first...which would not have worked out. These insoles can be cut to fit your shoe size, which is fantastic. I then had to remove my old insoles from my sneakers. I didn't know they were removable and would not have removed them if I hadn't read that I needed to do it! All that was left to do was to insert the gel insole. These went in super quick and easy as well. The gel part of the insole goes on the underside...so you won't see all the gel lines when they are properly inserted. When my Dr. Scholl's Massaging Gel Insoles were in my shoes, our family went for a long walk. I could immediately tell the difference in the shock absorption. It literally felt like I was walking on pillows. Not long into our walk, I noticed my hip pain begin to subside and by the time we had finished our walk, I had NO PAIN at all. WOW. I think it would be safe to say that I am a believer in these insoles now!! They are FANTASTIC and I would really recommend them to anyone...whether you have back issues or not. Dr. Scholl's Massaging Gel Insoles can be found at CVS and also at Drugstore.com for about $15.00. For more information on these and other Dr. Scholl's products, be sure to visit them on Facebook as well as on their website. Disclaimer: As a BzzAgent, I received no monetary compensation for this post. I did receive free Dr. Scholl's Massaging Gel Insoles and product coupons for review purposes. All thoughts and opinions are 100% mine. Stock photos and quotes are taken from Dr. Scholl's and BzzAgent Websites.